Artist Connie Haley of Haley Art & Design isn't quite certain where she first heard that line, but she's repeated it to herself many times as she's navigated her way through the art world. 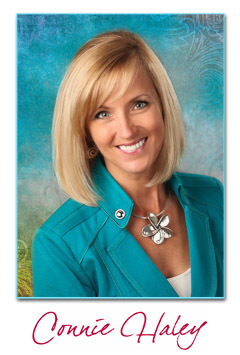 For the past eight years, she has been licensing her work to manufacturers and publishers who use it on a variety of products, from greeting cards to home decor to giftware. Haley began her career as the owner of an advertising agency, but discovered art licensing more than a decade ago when she began representing artists and photographers. 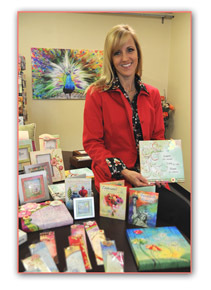 When she first began creating her own art for licensing, Haley put a small portfolio together and brought it to Susan January, vice president of Leanin' Tree Greeting Cards. They had worked together with another artist she represented, and when Haley showed her a small portfolio of about 12 images, January told her she wanted to build a greeting card collection of 40 around them. A farm girl from Michigan who now lives in East Texas with her husband and two children, Haley is a versatile artist with a constant need for progression. Regardless of the client, she demonstrates an understanding of the industry's latest trends and the fact that each client's needs are different. She's created several collections that are very different from one another, as when her tastes and interests change, so does her art. “I get bored with one design style after awhile,” Haley said, “but I always channel an abundance of creativity while keeping my clients' needs in mind. Haley's first collections were Freshcut Studio in 2003 and Paperheart Scrapbook in 2005. In her series of digital paintings simply called the Connie Haley Collection, she manipulates familiar images - making use of oils, watercolors and everything in between - to produce colorful, detailed artwork. Her collections also pair messages with art that draw on her respect for nature, her constant source of inspiration. When it's time to create, Connie approaches new ideas as both an artist and a pragmatic businesswoman, studying trends, going to gift markets every year and studying the trade magazines, publications and resources available. 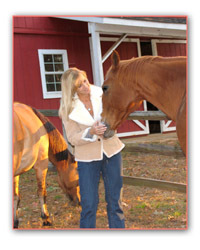 Connie's open approach to the creative process mirrors her business philosophy. She understands that the marketplace is fluid, and strives to be both proactive and responsive, anticipating a client's needs while working diligently to accommodate deadlines and special requests. Haley Art & Design has been fortunate to have long-term working relationships with several manufacturers, with each of those relationships unique in their own way. Haley said some have giant creative departments and others have no creative department at all. Some of them will bring specific projects and they'll work to their specifications. The other part of the time, they're busy coming up with imagery on their own, then finding the right company to license it to. And it's those creative opportunities that allow Haley to continually reinvent herself. Whether digital artist, advertising agent or retailer, the key to success is to move on and keep developing something different. After all, nothing good comes without a risk.